If you’re looking for information on your TransUnion credit report, you’ve come to the right place. Here, we’ll outline everything you need to know about your TransUnion credit report, including the types of information included in your credit report, what your score means, ways to improve your score, and more. While your credit score may seem like a simple three-digit number, it is actually anything but. Your credit score can have an impact on nearly everything you do in your life —from how much interest you pay on a credit card to your ability to get a car loan or mortgage, even the size of the deposit you’ll need when turning on utilities or getting a new cell phone. Your credit score is a direct reflection of the information found in your credit report — things such as your payment history, any missed or late payments, your total debt, and more. What’s more, you even have multiple versions of a credit report. Each of the three major credit bureaus, Equifax, Experian, and TransUnion, have their own version of your credit report — and each can possibly contain different information. In fact, each of these bureaus have their own “formula” for calculating your score, and not all creditors report to all three bureaus. This makes it very important that you’re checking (and understanding) all your scores. For the purpose of this article, we’re going to explore your TransUnion credit report. TransUnion is an American agency based in Chicago, IL that collects and aggregates information on more than one billion individual consumers worldwide, including 200 million files that profile nearly every credit-active consumer in the US. Its customer base also includes more than 65,000 businesses. Of the three Transunion is the smallest but at times the most important. In addition to its credit reporting services, TransUnion also markets credit reports, as well as other credit and fraud protection services, directly to consumers. And, as is the case with all credit reporting agencies, TransUnion is required by United States law to provide you, when requested with a free copy of your credit report every year, at no charge. Why is your TransUnion credit report important? * There are states that are now prohibiting employers from checking prospective and current employees credit. For more information please visit our article on this topic. And, believe it or not, the information contained in your credit report can actually affect the outcome of each of the scenarios above, so it’s important to stay on top of your credit reports to make sure that the information they contain is accurate and up-to-date. If you’re unsure of your credit score, or have never checked your report, you’re not the only one. 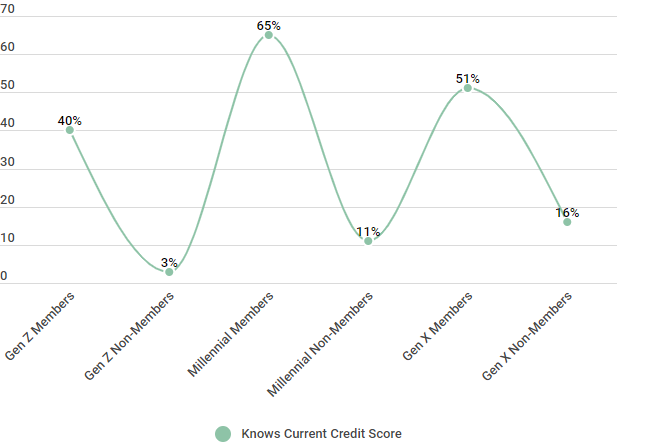 Below you can see that nearly three quarters of 18- to 24-year olds didn’t know their credit score in 2017, and the older generations didn’t fare much better — with nearly half of those 25-44 and more than half of those 45-54 also unaware of their scores. Source: We surveyed 650 US consumers on 9/5/18 during a time period of 2 weeks. But, when you know your credit score, you can make better informed decisions about your financial future — or take steps to improve your score, if necessary. Keeping that in mind, let’s take a closer look at some of the details of your TransUnion credit report. While the FICO Score is easily the most well-known model for credit scoring, the three main credit bureaus —Equifax, Experian and TransUnion— created the VantageScore model in 2006 to act as a more “predictive” scoring model. And while a good VantageScore usually means you also have a good FICO, the individual factors that contribute to your credit score (as well as the impact each of those items have on your score) are a bit different. Payment History. Your payment history is the single biggest factor that contributes to your score. Make all of your payments on time, every time, and you’re well on your way to a better score. Length of Credit Use & Variance of Credit. The age of your credit history, as well as the variation in your credit, accounts for a fifth of your credit score. Always keep your oldest accounts open and in good standing, and make sure your credit report reflects different types of credit (e.g., credit cards AND an auto loan). Credit Utilization. Your credit utilization is another large factor that contributes to your credit score. Simply put, your credit utilization is the percentage of your total credit limit that you are currently using. You should always aim to keep this number below 30 percent. New Credit Applications. Applying for too many lines of credit can make it appear to potential lenders as if you are in desperate need of funds — a big red flag. Keep the number of new credit applications to a minimum for the best score. Balance. Lastly, your current credit balance also plays a part in your credit score. Keep the balances you carry as low as possible to see the best score. Available Credit. While only contributing to a relatively small percentage of your credit score, the amount of credit you have available can make a difference. Keeping your credit utilization low ensures that your available credit will reflect positively. As you can see from the chart below, each of these factors are weighted differently —meaning they each contribute to your score calculation in a different manner. Payment history is by far the most important factor at 41 percent, while your available credit, balance information and new credit applications, though still important, will have a much smaller impact on your overall score. The factors that make up your credit score are straightforward enough, but do you know what your score actually means? It’s one thing to know your score, but do you know how that translates into the real world? Let’s look now at the different score ranges for TransUnion — and also how you can use that information to help improve your score. 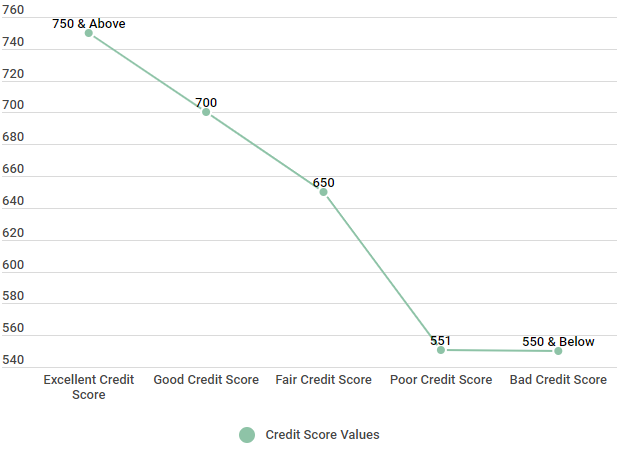 Below are the credit score ranges that are generally attributed to TransUnion scores. As you can see, VantageScore scores range from 300 to 850. Source: TransUnion VantageScore 3.0 model. So, now you know the factors that contribute to your score, but do you know what your score means? It’s one thing to know your score, but it’s another thing to know where that places you in the grand scheme of things. Let’s look now at the different score ranges for TransUnion and how you can use that information to improve your score. How do I raise my TransUnion score? Clean up your credit report. Before you do anything else, request a copy of your TransUnion credit report. Examine everything in your report, looking in particular for any negative or inaccurate marks you can clean up. Dispute any errors you find with TransUnion. Pay down your balances. A big factor that contributes to your credit score is the balance that you owe, or the percent of your total credit you’re currently using. Paying down your balances also lowers your credit utilization, and can help you quickly see an improvement in your score. Increase your credit limits. If you’re not able to pay down your balances, increasing your credit limits can have a similar effect on your overall credit utilization — as long as you don’t add more to your balance. Make payments twice a month. Even if you pay off your balances in full each month, your credit card companies still only report data once a month — so this could still come back to hurt you. For instance, let’s say you have a $1,000 limit on a credit card that you use for mileage — hitting your limit each month and then paying it off in full. There’s a chance your credit card company will report that you have a $1,000 limit AND a $1,000 balance — which translates to a 100 percent credit utilization. Making a mid-month payment will help prevent this. Become an authorized user. If none of the above tips are working, or you aren’t able to implement them, don’t despair. Becoming an authorized user on someone else’s account (with more established credit) can lend you instant credibility. We interviewed David on November 7, 2016; he earns $41,000 a year is 32 years old and lives in York, Pa. He is single and doesn’t have kids and is currently working as a manager at a local restaurant. How were you able to raise your TransUnion credit score? I asked my credit card companies to increase my credit limits and reduced my credit use down to 25 percent. I applied for new credit cards that offered an introductory zero annual percentage rate for 18 months. I was able to pay off my debt and raise my TransUnion credit score substantially. Finally, I can stick to my budget. What was your score previously, and what is it now? When I was simply treading water with debt, my credit score was 655 with TransUnion. Now, after a few wise choices my credit score is 725. The most important thing I learned was to learn about how things work. How long did it take for you to see a difference? It took me the full 18 months to pay off my debt. However, once I paid off my credit cards with the help of the zero APR, I saw my range rise within six months. I keep a close eye on my credit report and stick to my budget. I only use my credit cards for planned and budgeted expenses. David’s story is a great reminder to all of us that it’s important to check your report, to stay aware of your credit score, and to focus on the basics of improving your credit score. Related to "TransUnion Credit Report"
As you can see by the data below, there is a definite advantage to regularly monitoring your credit. 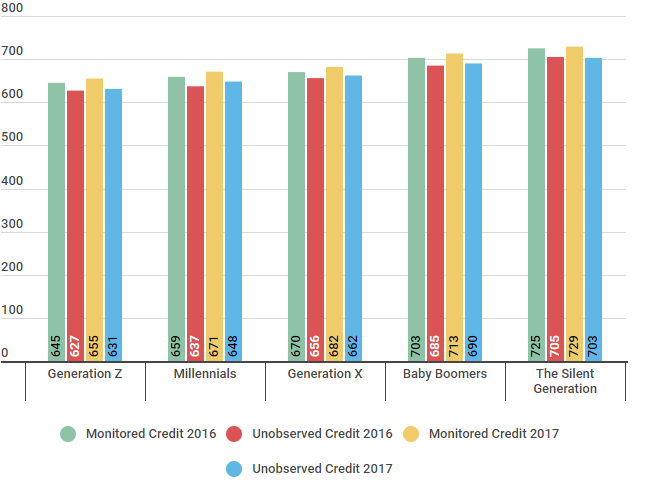 Regardless of age or generation, those who monitor their credit have higher scores than those who don’t. Source: Credit Sesame surveyed 1500 individuals randomly selected to take the survey. The study was conducted in January of 2018 over a duration of three weeks. In conclusion, your TransUnion credit report is a compilation of the information gathered on you by TransUnion, one of the “Big Three” credit reporting agencies. Scores range from 300 to 850, similarly to the other credit agencies. There are a number of factors that contribute to your score, including your payment history, credit utilization, balances owed, length of credit use, number of new applications, and more. If your score isn’t where you want it to be, there are steps you can take to improve your credit, even in as little as 6 months. With responsible credit habits and time, any score can be improved — and you can enjoy the perks of better credit. Caryn Anderson combines extensive behind-the-scenes writing experience with her passion for all things food, fashion and finance. Anderson honed her craft while earning her B.S in Communication Studies from New York University. How Long Does a Collection Stay on my Credit Report?